This is like the Buckingham Palace equivalent of Denmark. There are guards with big fluffy hats, and there’s also a changing of the guards. What is surprising is that you can drive right through here, there are no gates. You can feel that the security is slightly higher here, and you also need to wear shoe covers when you enter. All of the rooms are on displayed however walled off with glass. 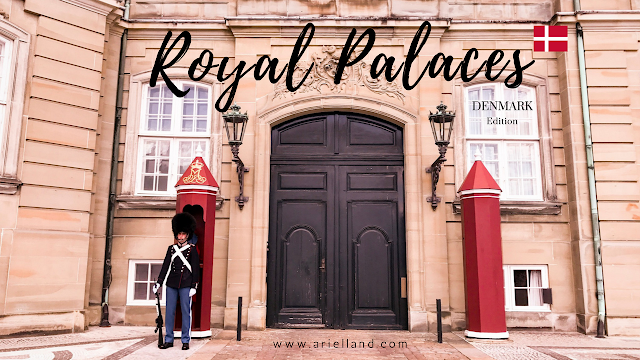 You can visit a limited number of rooms, so it is perfect if you have a short time in Copenhagen as all of the other Palaces and Castles are much larger. To get to Rosenborg, you have to first walk through the King’s Garden. It is free of charge and for anyone to visit. The grass was kept very nicely, lush and full of life. The Castle is surrounded by water, to enter you walk over a small bridge over the canal. There are also guards here, however not dressed as fancily as the ones at Amalienborg. They look like regular soldiers on duty. There’s 2 parts to visiting Rosenborg, first is the castle itself, and then the treasury which is in the basement. When you purchase tickets, it will tell you your entry time so they can avoid too much of a crowd inside the small rooms. The interior decoration was just absolutely stunning, with wallpaper covering each room and painting on the ceilings. There’s also a big throne room hall with lion statues. You can just imagine how much riches the royal family had. Downstairs in the basement, they had all kinds of gold, silver, gems on display – including the crown of Christian IV, the most sparkly shimmery item I’ve ever seen in my life. Security was strong with cameras everywhere and the security man sitting in the middle of the room. Read more about the many other Palaces and castles of Denmark under the lable Travel - Denmark on the left hand column, Frederiksborg Castle and Christiansborg Palace specifically. Thank you so much :) Happy Travels! "Visit Forbrugermagsinet.dk for recipes, articles, travel ideas and much more!"